It is normally about this time of the year that I start to look in more detail at what is coming up later in Summer and in to Autumn. Up until now I just think of them as 'They are in the future no need to worry too much yet' type events. But I keep them marked on the year planner and as they get within 'reach' so I start to get in to more detail about them, like timings etc. How is your summer planning going? Of course it is Friday so feel free to discuss anything planner related. What the outer material of your organiser is made from has the biggest influence on the potential life span of your organiser. Whilst there are hard wearing synthetic materials, the most commonly used material is leather. The cover is the part you will most frequently touch, you will hold the organiser by the cover, it is the most visual part of your organiser. Therefore the choice of leather, its colour and texture is going to be a very personal decision, only you know what you like or don't like. There are various types of leather, not just what animal it originally came from but how the leather has been treated or coloured. Leather comes in the following forms. You will find most of these types used for organisers at different price points. 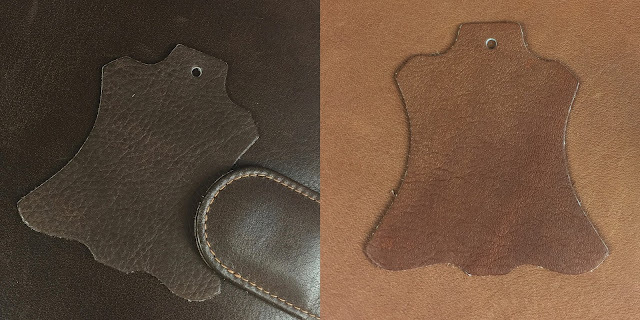 Full-grain leather refers to hides that have not been sanded, buffed, or snuffed (as opposed to top-grain or corrected leather) to remove imperfections (or natural marks) on the surface of the hide. The grain remains allowing the fiber strength and durability. The grain also has breathability, resulting in less moisture from prolonged contact. Rather than wearing out, it develops a patina during its expected useful lifetime. This type of leather is used in the most expensive organisers. 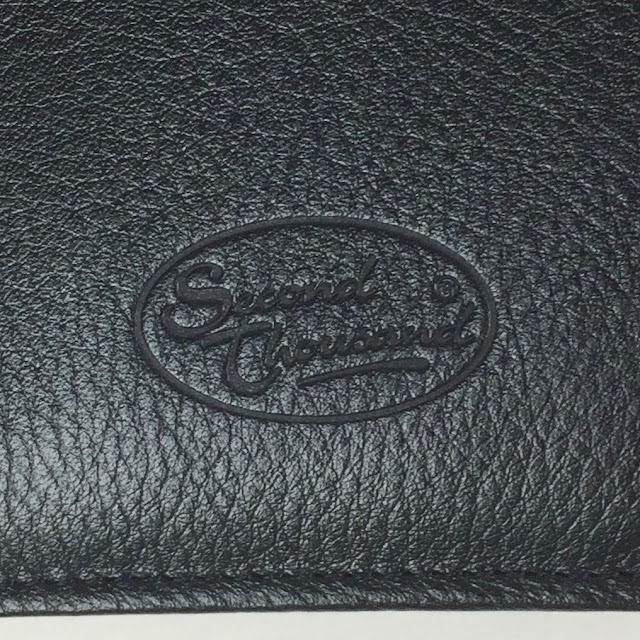 Corrected-grain leather is any leather that has had an artificial grain applied to its surface. The hides used to create corrected leather do not meet the standards for use in creating vegetable-tanned or aniline leather. The imperfections are corrected or sanded off, and an artificial grain embossed into the surface and dressed with stain or dyes. Most corrected-grain leather is used to make pigmented leather as the solid pigment helps hide the corrections or imperfections. Split leather is leather created from the fibrous part of the hide left once the top-grain of the rawhide has been separated from the hide. During the splitting operation, the top-grain and drop split are separated. The drop split can be further split (thickness allowing) into a middle split and a flesh split. In very thick hides, the middle split can be separated into multiple layers until the thickness prevents further splitting. Split leather then has an artificial layer applied to the surface of the split and is embossed with a leather grain. Bonded leather or reconstituted leather is an economical material that uses leftover organic leather (from tanneries or workshops) that are shredded and bonded together with polyurethane or latex on to a fiber sheet. 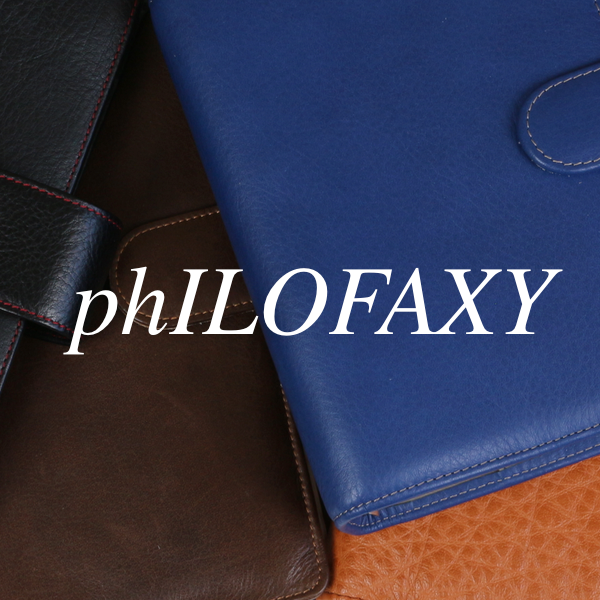 The varying degree of organic leather in the mix (10% to 90%) affects the smell and texture. Its reduced cost makes it popular for furniture upholstery, especially for commercial furniture that requires durability—though durability can vary widely depending on the formulation. The leather goes through a series of processes to make it useable and to dye the leather. Some leathers are dyed and then have a protective layer added to them so that they are more resistant to water damage and staining. The leather can be dyed a variety of colours some leathers being easier to dye than others. 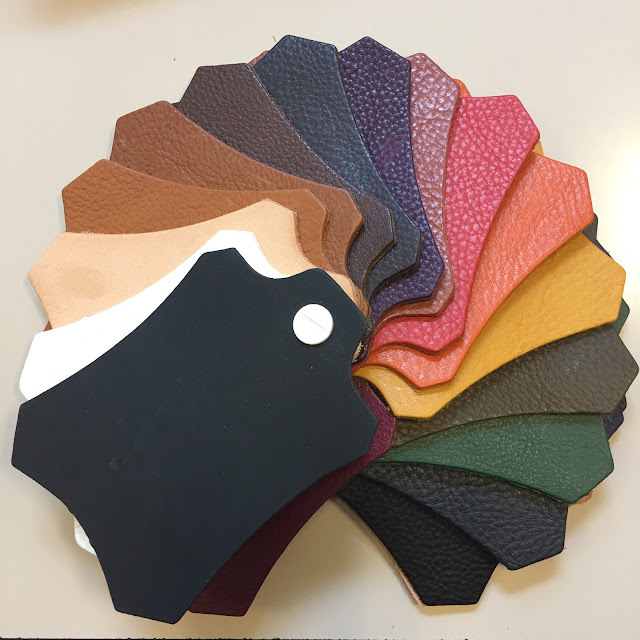 So for instance the full gain leathers like these samples above are in a more limited colour range because they use vegetable tanning type dyes to colour the leather. 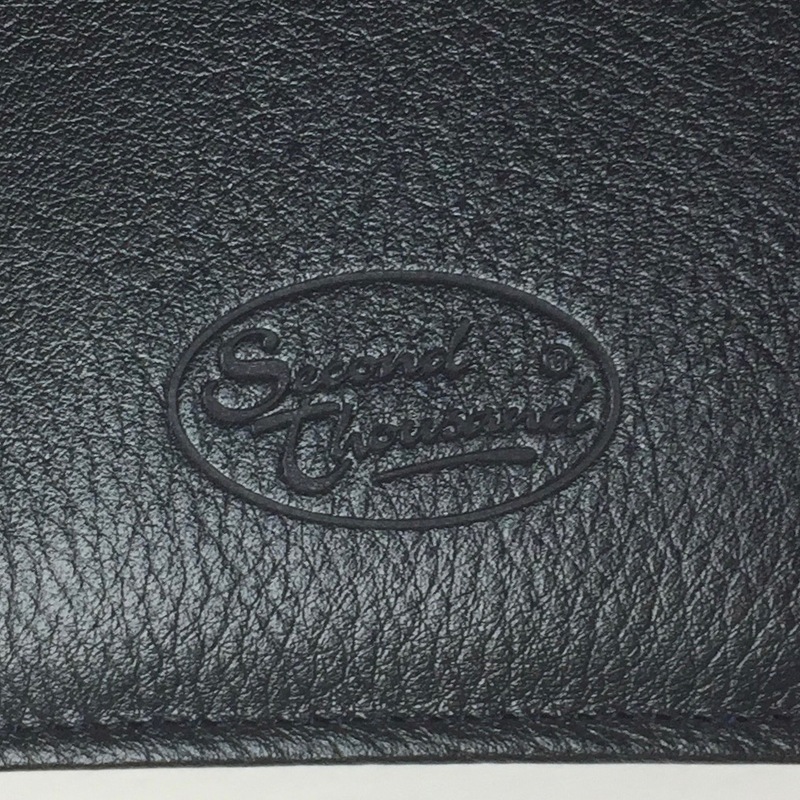 Where possible I always recommend getting leather samples especially if you are having a custom made organiser. If you want to be reassured about what type of leather you are getting, ask the seller of the products. Between the internal and external leather, there will be hidden a variety of materials that you will often not be aware of. 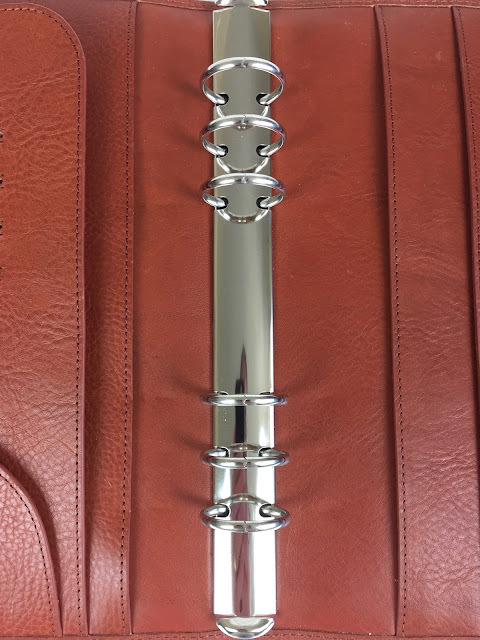 Even organisers that feel very soft and supple will have a lining material between the leather to prevent them from 'creaking' as they are opened and closed. This lining material is often just a synthetic mesh textile material. In addition to the liner some organisers have a stiffening board inserted between the two layers of leather. This board material can be a cardboard (carton) sheet material, or a manufactured synthetic leather board known by the trade name of Bontex. Bontex is a very flexible material you would hardly know it was there if you flex the covers, but it helps to provide stability and stops the covers from curling. 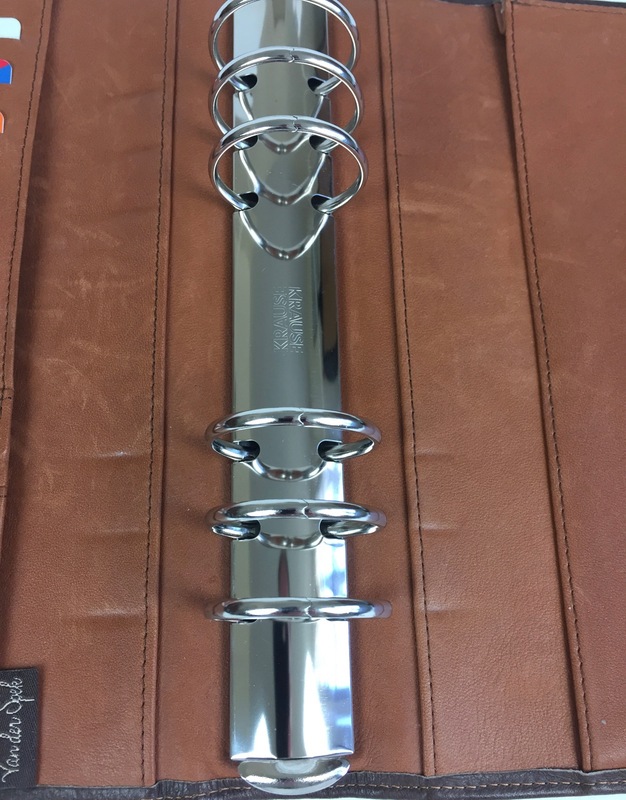 There is also Bontex Frame, this is used on the stiffer leathers to help with the assembly of the organiser. 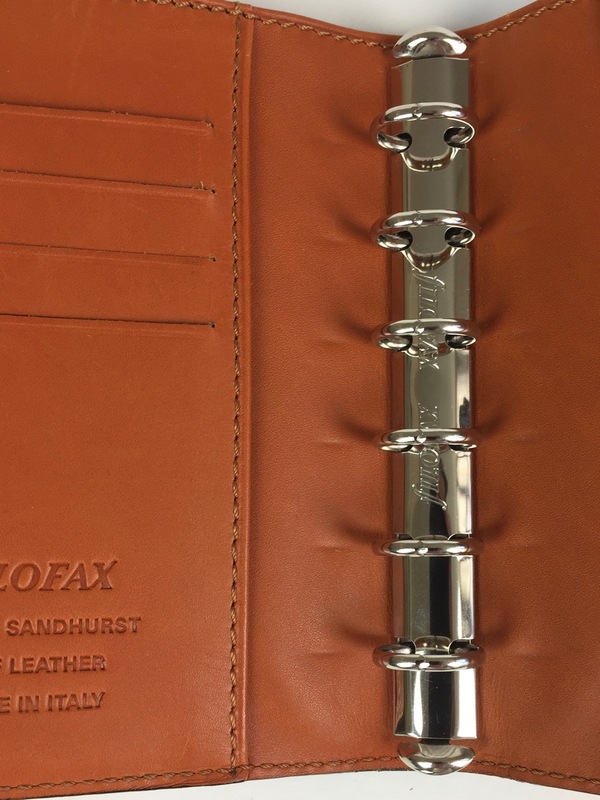 When ordering a Van der Spek Custom organiser you can specify what sort of leather stiffener will be used on your order. Watch the video below to see a full comparison of Bontex and Carton and see for yourself which is which. Leather is a natural product, it isn't indestructible, it needs caring for over time. Try to avoid getting the leather wet and do not store in areas of high humidity. Likewise avoid areas of extreme temperatures for long periods of time. Some people advocate not treating their leather organisers. I recommend asking the manufacturer as to what they recommend as they will know the type of leather used. So as you can see from this post and the previous posts in the series, there are quite a lot of things that go together to make 'The Perfect Organiser' be it ready made or a custom handmade one from Van der Spek. If there are any elements I've not covered in this short series of posts, please either leave a comment or drop me an email steve at philofaxy dot com and there might be additional posts for the series. A-Z index tabs are traditionally used for separating your address pages. What else do you use them for? 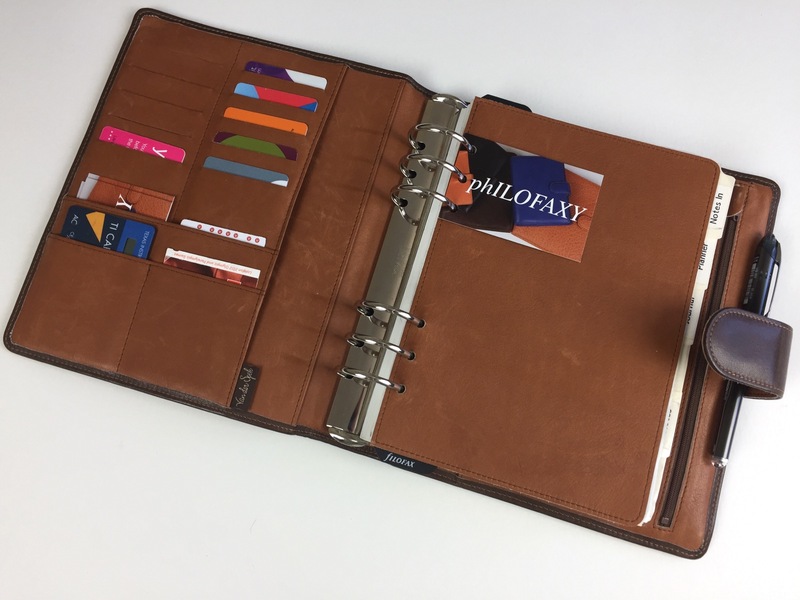 July 2017 Filofax Black Malden Setup featuring DIYFish inserts - One Fantastic Find! The design of your organiser is a very important thing. 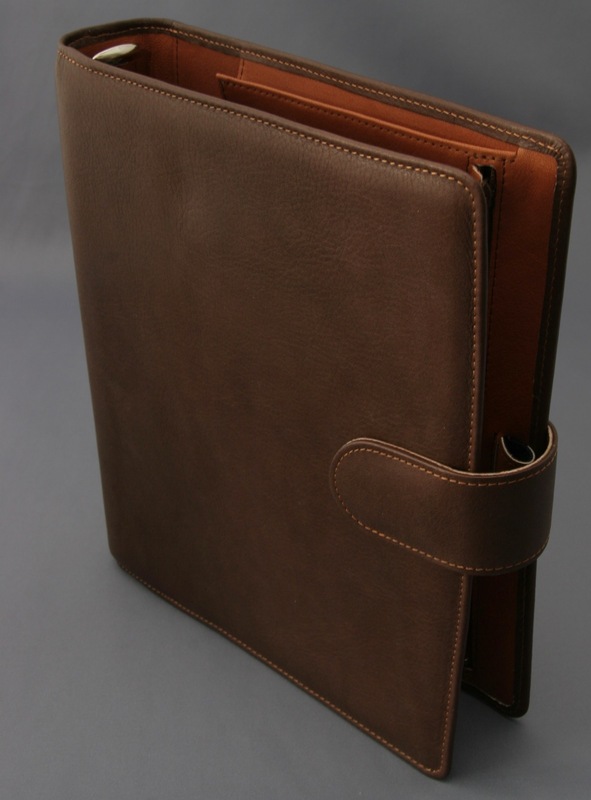 If you are buying a custom designed organiser from Van der Spek, then you have a large range of options to choose from. Other manufacturers give you a fixed design with no options to customise so you are left to hunt around for the perfect design for your own requirements. Hopefully this post will help you decide which is the best for you. If you have never designed your own organiser or planner before then number of configurations are endless, but there are a few design rules you have to apply. Some of the terminology used might be new to you as well. Let us show a variety of design features and try and de-mystify the terminology, sorting out your slip pockets from your secretarial pockets, and how many variations can there be of credit card pockets? Read on, this going to be fairly picture heavy. Second Thousand is an old brand name/trade name of Van der Spek in the Netherlands. I'm told it dates from around about 2007. I was given this A5 when I visited the factory for the first time with Janet Carr back in October 2014. From the outside it looks a fairly modest organiser, but it has the classic design cues of being a Van der Spek, remember the company was established in 1926 so some things are well established in their design heritage. On the rear cover at the base is the trade mark embossed in to the cover. The leather as you can see is nicely gained and is soft and supple. The interior layout reveals a huge array of pockets. On the left hand side inside cover there are 8 credit card slots plus a business card slot at the foot. 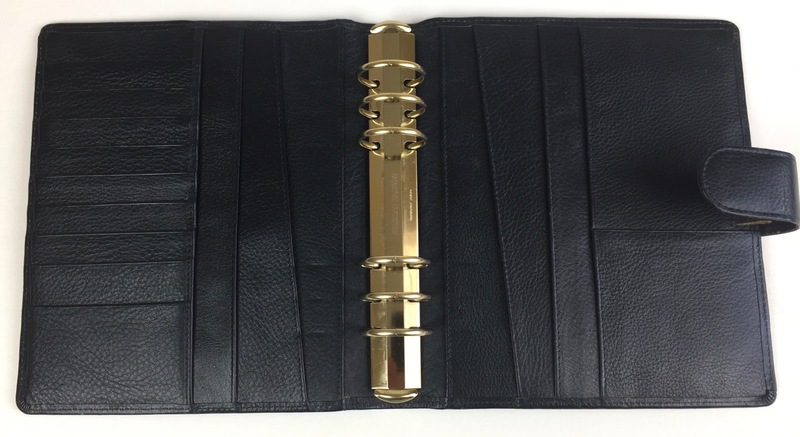 There are three vertical slip pockets, one behind the credit card slots, an intermediate one and the inner one with a diagonal profile. This is mirrored on the opposite side with another three vertical slip pockets. 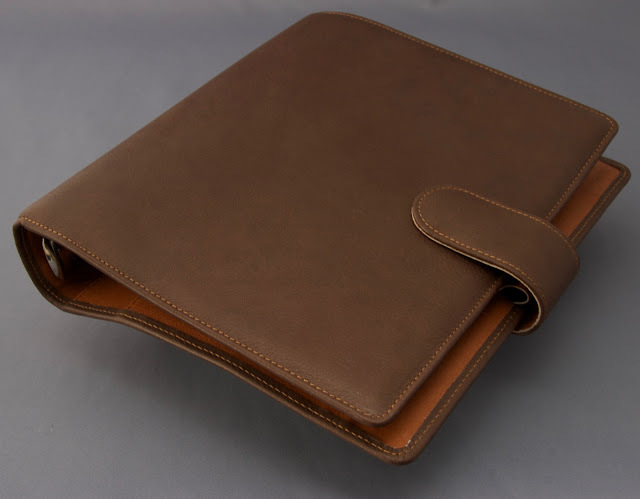 There is also an additional deep card pocket as well as all leather pen loop tucked in behind the generous size clasp. 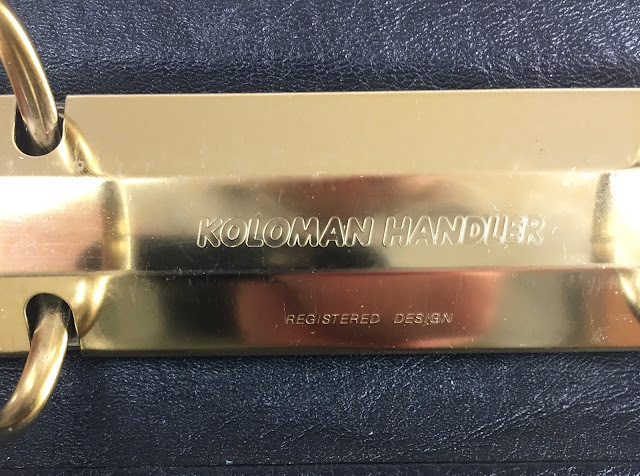 The rings in this particular example are 35mm Koloman Handler rings, Koloman Handler is another brand name of the modern day Krause rings company. So they are excellent quality and I've not had any issues with them in the last 2-3 years I've used this organiser. 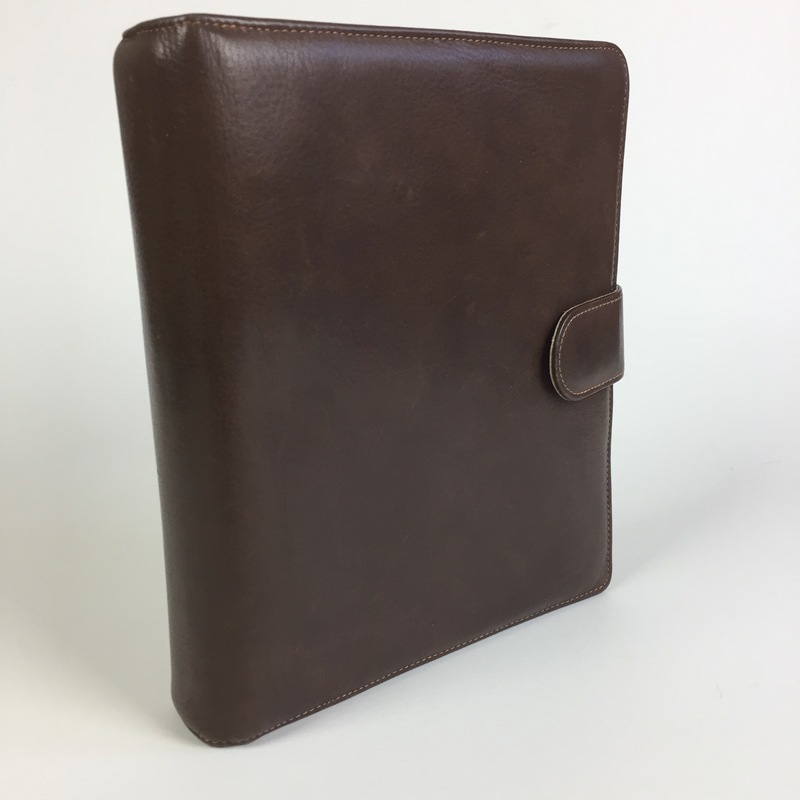 The covers of the organiser do have stiffener between the layers of leather, but that doesn't mean it is not supple and it can do this sort of organiser gymnastics! With light pressure the edges of the covers will touch, but for the ease of being able to take the photo I used the clasp! This is the equivalent of putting your hands behind your back and touching your finger tips together. 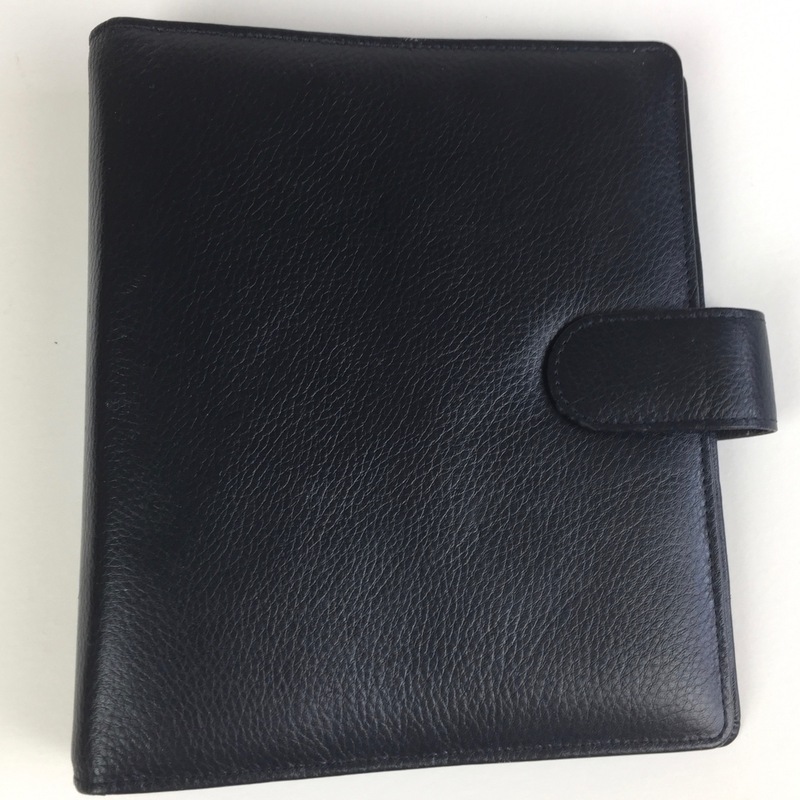 I tried the same 'floor exercise' with a Filofax Malden A5, it can do it to the same extent, but it's no were near as supple at the hinge point at the spine/cover junction as this Second Thousand organiser is! Janet has a lovely blue leather version of this organiser, read her blog post from 2014 here. After taking the photos for this post I moved back in to this organiser from the newer A5 Custom I showed you last week. I can see now why I like this one so much, it might not have a zip pocket, but it makes up for it with a whole host of other slip pockets which allow you to store papers easily and without any confusion as to what is in what pocket. I really like it. It is tough as well, it doesn't mark or show scratches. The current day Touch Me range have added to this design, whilst retaining all the good things about the older design. The beauty of Filofaxes is that they're completely customizable. They don't even come with an instruction manual to tell you how to use them. I would say, start with week-on-2-pages and a bunch of to-do pages and blank paper. Just dump everything in your brain in there, and then it will become clear whether you need to start using tabs or custom pages. Of course, since it's Friday, feel free to make any organizer-related conversation you wish! A perfect organiser isn't complete without inserts? Inserts that are right for your needs. Inserts printed on paper that work with your choice of pen or pencil. Naturally I would say that Philofaxy has the perfect inserts for most peoples needs, but that might be a bit over ambitious. Yes of course I use them myself, but I do recognise that they aren't for everyone and we know some people don't like the printing themselves routine. 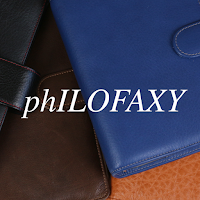 So putting the Philofaxy option to one side for a moment what other options are there? Surprisingly quite a lot of options these days, more so I would say than a few years ago. Paper planning is alive and well. And many more I'm sure. So there are a lot of options out there, but how do you pick the right one for you? Trail and error mainly, hopefully not too much of the later! I always recommend getting some sheets of blank paper and cutting them to the size you wish to use (Personal, Pocket, A5 or whatever) and try out different hand drawn layouts for daily, weekly etc formats. Populate the pages with a typical weeks worth of tasks and activities and see how full or empty a typical week or day is. You might need to do this a few times until you find the optimum layout. Then go looking for a similar layout in that size. You will find testing things out with plain paper first will save you a lot of wasted money/paper. If you don't find the perfect insert first time around, try not to jump to something else until you have worked out exactly what doesn't work on the current layout after 2-3 weeks, give it time. No two weeks are the same so the 'loading' on your planner/diary might be very different from one week to the next. Pens or writing instruments of some sort naturally are linked to inserts. The two have to be able to work together in terms of ink on the paper. If possible try to get a sample of the paper that is the same as the inserts to test out your pen of choice on. If you are printing your own inserts, some stationery stores sometimes offer paper sample packs with one or two sheets of the different papers they stock. These can be useful to test out if fountain pen or gel ink soaks in to the paper too much or just sits on the surface and takes longer to dry. Also remember to test or check that your preferred pen will fit the pen loop on your organiser. Some on-line stores give an indication of the diameter of the various pens, this is useful for organisers without elasticated pen loops. The list goes on and on, there are more I've possibly missed out! We all have a top three in our list I would think if we are looking at swapping in to another organiser or buying a new one. What are the top three 'must have' features for you? 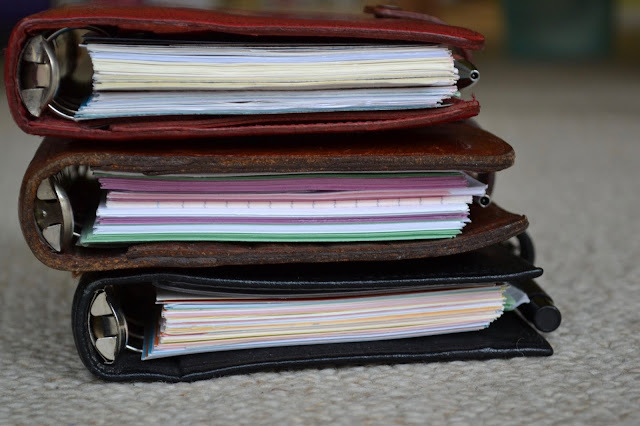 There are many factors that go together to make a 'Perfect Organiser' so I thought I would break this down in to easy to read bite size chunks and write it as a mini series of posts. Yes this is my own point of view, your thoughts might be different! But please do comment if you have other thoughts to add on each post. Let's start with rings... as you might know it's a topic dear to my heart!!! 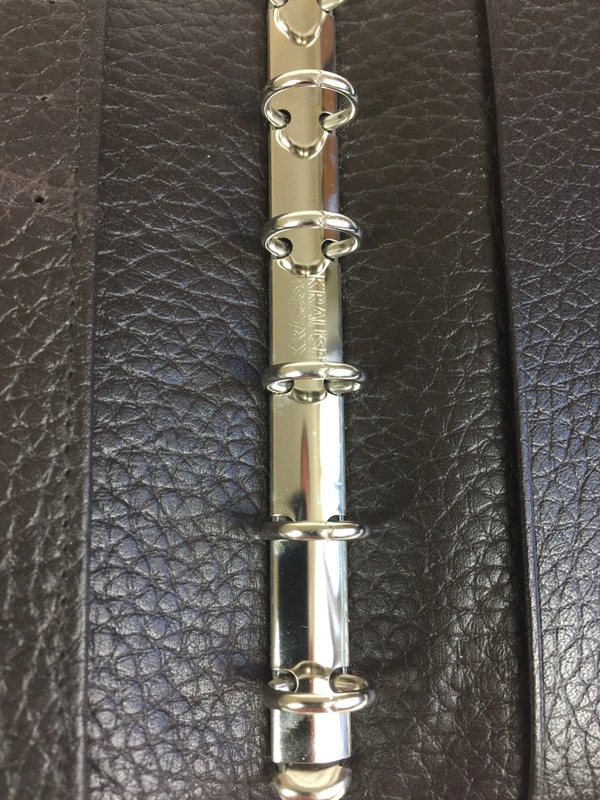 The rings in an organiser vary in quality from cheap non-branded ones that are riveted in to removable/replaceable Krause rings at the other end of the scale. 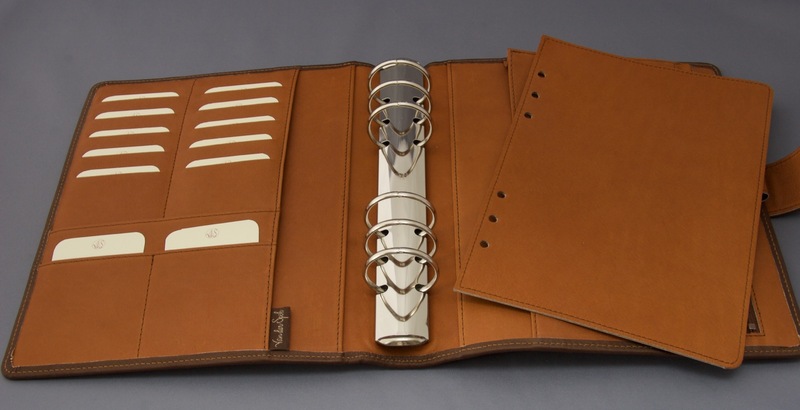 In cheaper organisers from companies such as Filofax, Paperchase etc the rings tend to be riveted in to the organiser. In some cases these might be replaceable where the rivets go through the spine of the organiser, but on other models they aren't so easy to change. In the majority of cases you shouldn't have any issues with these rings in normal everyday use. Occasionally you might get some small gaps develop or it might even arrive with gaps in the rings. Having seen a good number of people with ring gaps on this type of ring mechanism I devised my own method for 'curing' this issue, which you see described here. However, if you take care in opening and closing the rings this type of mechanism shouldn't suffer any issues. I have many organisers in my collection with these type of rings and I've not had any issues over the years. Any mechanism can suffer if the organiser is dropped off say a desktop on to a hard floor with a full set of inserts on the rings. So just be careful and you should be ok. 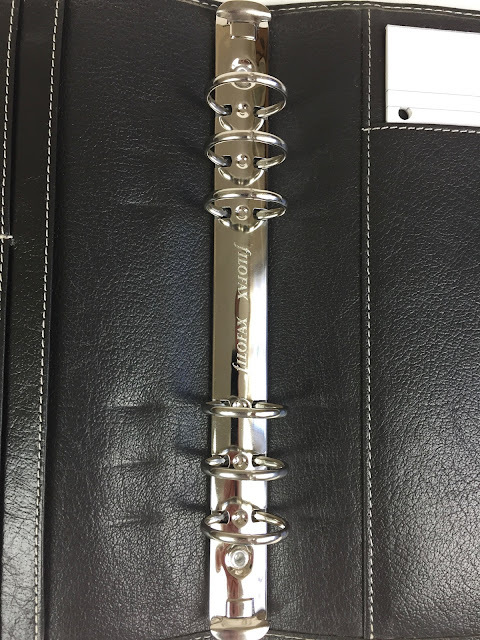 If you are buying an organiser in person be sure to inspect the rings and run the tips of your fingers over the join to check for any misalignment. Your fingers will feel the step much better than your eyes will. If your organiser has the removable type of ring mechanism you can of course upgrade them and fit Krause rings available from Van der Spek. However shipping can be expensive if you only want one set. It is best to get a small group order together to share the cost of shipping. I've upgraded nearly all of my Gillio organisers with Krause rings, they seem to be better made than the ones supplied with their organisers. Naturally if you have any questions about rings. Leave a comment below. I took my A5 Manager with me to the Van der Spek meet up last weekend. I have had it now for over 3 years, it arrived on 22 April 2014 (after checking the date in my journal). It is made from Napa leather inside (6208) and outside (6202). Here are the photos taken when I received it in April 2014. Petra was quite surprised to see how shiny the outside had become and asked if I had put anything on the outside leather. No, nothing just been handled quite a bit. The outside appears to have got darker in colour, as you can see from the photos below, but this might just be the camera being fooled by the nap of the leather a little. Here are it is with some leather samples so you can see a slight difference. It has not been in constant use for the last 3 years, I do occasionally swap in to other A5's. However, this has been my main A5 for a good proportion of the time. It did all of the USA/Canada trip in 2015 and has travelled with me on most other trips. These days it serves as my reference organiser, always to hand on my desk with another smaller ringed A5 Van der Spek being used as my main planner. Brighten up: Switching out to a brighter, sunnier color or pattern. Lighten up: Using a synthetic material binder instead of leather, and/ or changing to a binder with a smaller ring size. Downsize: For some people, summer time is less busy than the rest of the year so they like to use a smaller page size in a smaller, more portable binder. 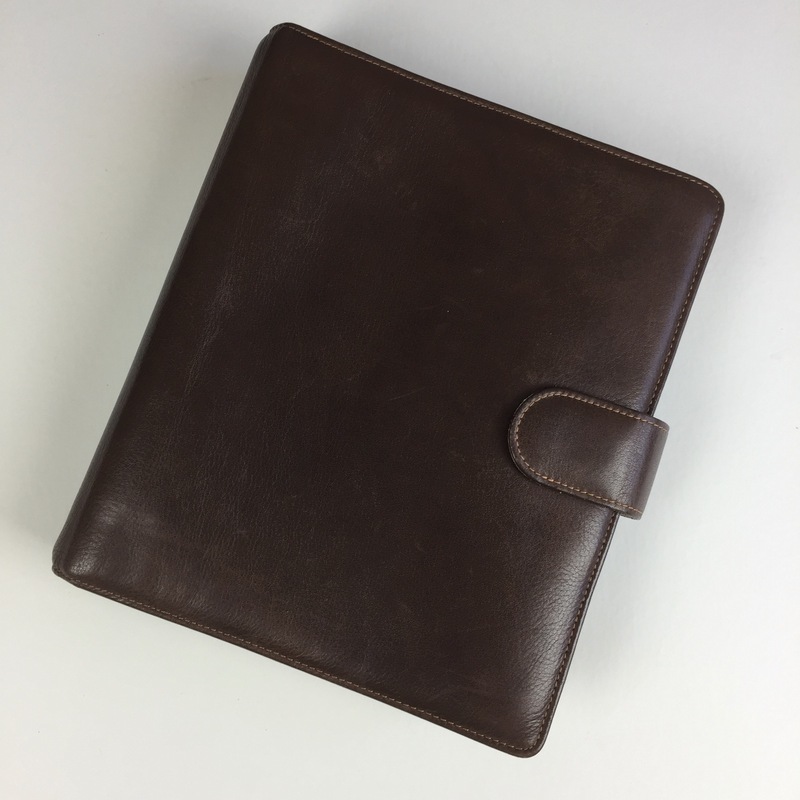 Travel: Often when traveling it makes sense to leave most of your day to day pages at home and only take with you what you will need for your trip, in a slimline binder. Are you changing to a different binder this time of year? I don't suppose I'm alone in admitting that over the years I've used a variety of different pens in my organiser. What is your favourite pen or pencil that you use regularly in your organiser? This last week I spent a few days in Rotterdam visiting Van der Spek and at the weekend we had a meet up with a small group of people attending from various parts of Europe. 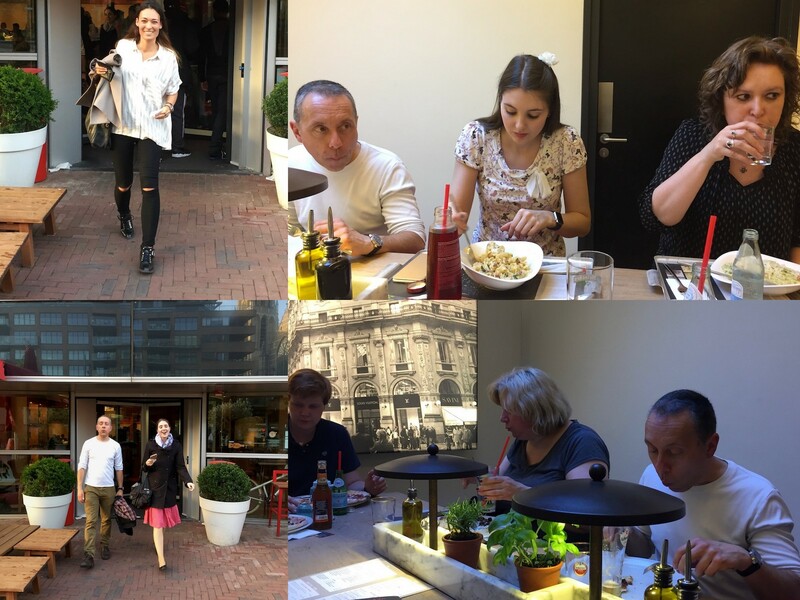 This was the third Van der Spek meet up that we have held. It was as enjoyable as all the rest, but I think we even improved on the previous ones. We kept more or less to the previous format, although I suspect we might look to change a few things next time around. 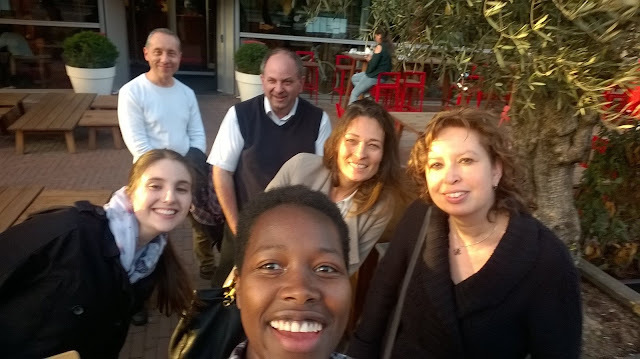 On Friday night we met up in Rotterdam for a meal and a 'getting to know each other' evening. The weather was very kind so walking outside was very pleasant and the evenings are of course still very light. I'm not sure where the time has gone... but this was two years ago. 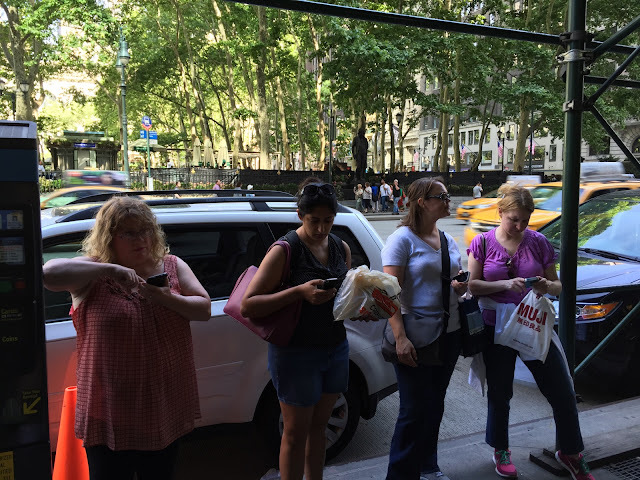 The New York Meet Up in June 2015 that I attended. It was the start of our epic tour of the USA and Canada, spread over 7 weeks with 6 meet ups!!! On the count of three.... check your phones !! I'm sure by posting this there might be renewed interest in having another New York Meet Up? Red Winchester, Mulberry agenda and personal Kensington. For quite some years now, my system has consisted of a personal for my GTD based set up, plus an A5 for planning projects and for making more extensive notes. Using two together like that was perfect for a long time, but then one day it just wasn't... I did a review, drew mind maps and tried all my usual methods, but couldn't figure out why. However, because it was so familiar, I doggedly carried on trying to use it but without much success. I bought another A5 Ascot, with the hope that a wonderful binder like that would somehow encourage and motivate me to use it. And with time, it became clear to me that I wasn't enjoying these repeated A5 failures and they certainly weren't helping me get stuff done. I sold the Ascot last year, gave away all my inserts and then breathed a sigh of relief! With hindsight, I now understand that my focus is so much on my personal that I just don't end up looking at the A5. 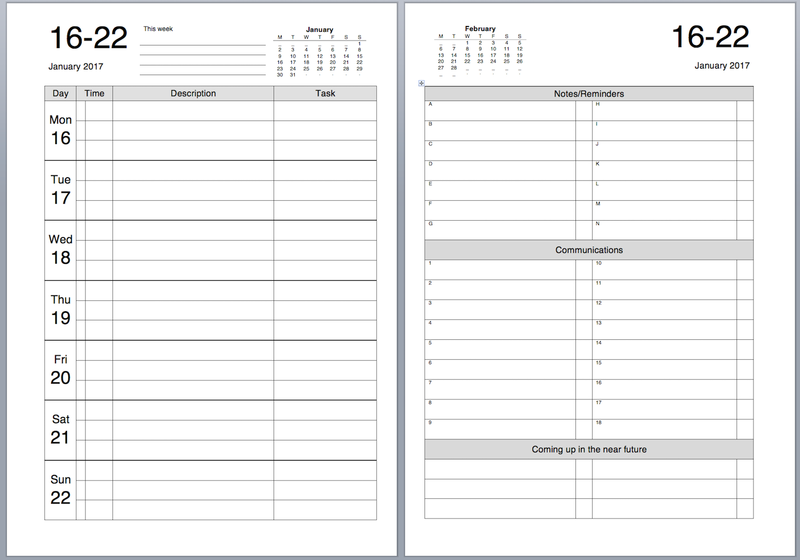 Have you recently changed your planning habits like this, or had an epiphany about something that needs changing? And as always, it's Friday again so please feel to discuss anything ringbound related. Have a great weekend. 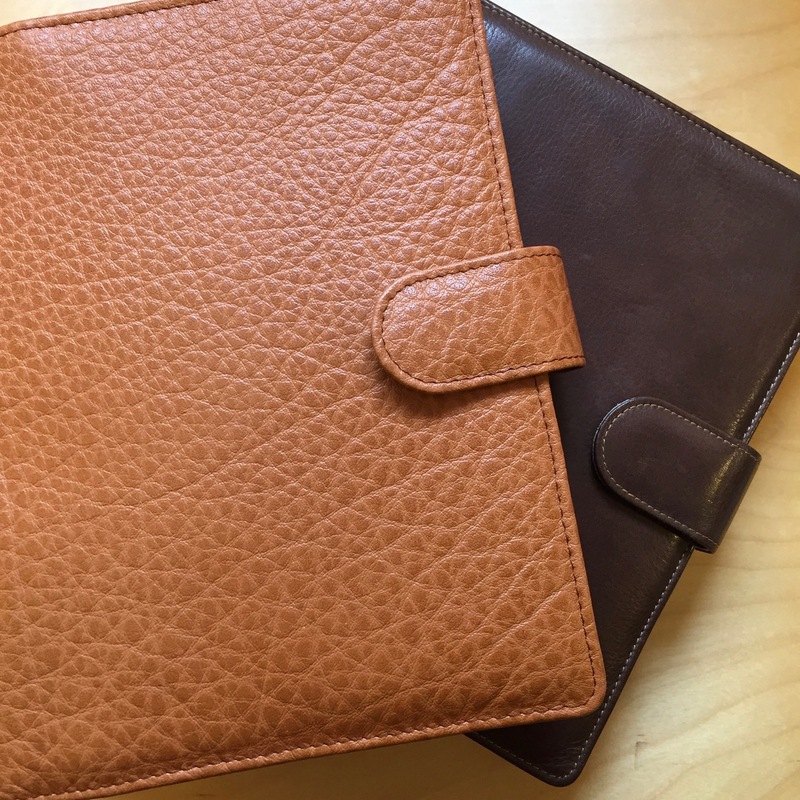 One of the most frequent questions I see asked is about caring for the leather of your organiser/planner. To clean/treat or not to clean? There have been people that have used hand creams on their organisers, this seems to have stopped after people noticed that there are additives in hand cream that aren't always good for leather products. Personally I prefer a natural beeswax type product, but used sparingly and not very often. So do you clean or treat your organiser or not? If you do what do you use?